With the Backstreet Boys Cruise just a week away, many cruisers have already planned out each theme night outfit down to the very smallest detail. And then there are those that are still having issues coming up with a final decision. Planning a theme outfit can be easy to some people and to others, can be extremely difficult. For instance, if various other fandoms aren’t your thing, you may have trouble with We’ve Got it Going Con night. If you’re a person who loves to wear dark colors, Millennium night might not be your favorite theme ever. 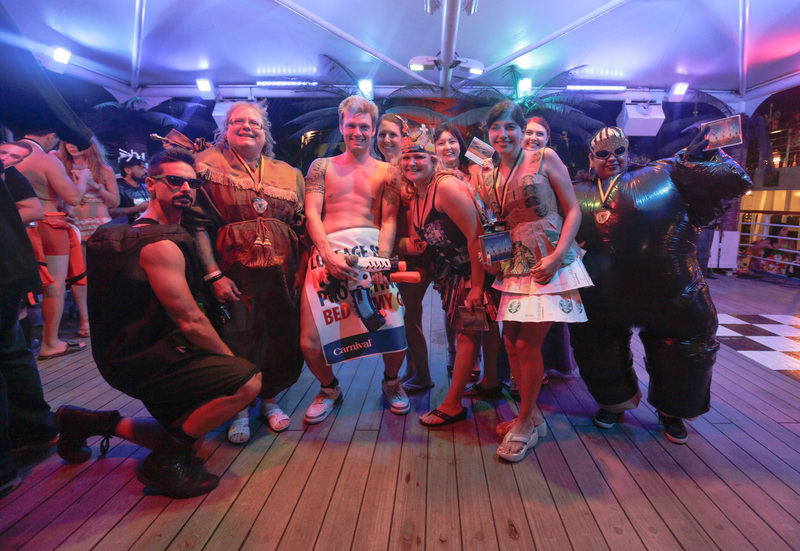 While it’s not mandatory to dress up for the theme nights, it’s always a good idea to have the most fun you can have on a Backstreet Boys cruise. Plus, you never know who is going to see your outfit and think it’s the best thing ever. For ABC (Anything But Clothes) night on the 2014 cruise, Christina’s outfit was a plastic table cloth that was wrapped around her. Mara Sansolo, who will be cruising for the fifth time this year, is taking it easy this year after creating a dress made of book pages for ABC night in 2014, but fell asleep before the deck party and never got the chance to wear it. Nicole Meighoo’s biggest piece of advice is to be comfortable in your own skin. “Have fun with it,” Line Vennesland said. “This year’s themes are all about using clothes you already have in your closet." While it’s easy to give advice for those who have been through the cruise theme process, some cruisers just need ideas or a place to get started with a hint of an idea. - Think of your favorite high school movie or television show and dress up like one of the characters. - Don’t dress for the decade you went to high school. Dress like a high school student from another decade, such as the ‘50s or even ‘70s. - Dress like a high school student 50 years from now. How do you think teens will dress then? - You do not have to dress like a comic book super hero. Dress as your favorite cartoon character, movie character, television character or even an inanimate object (think the phone booth from “Dr. Who”). - Dress as your favorite toy as a child. - Dress up as the Backstreet Boys’ comic book characters. - Disney Princesses. Disney Princesses. Disney Princesses. - Married? Wear your wedding dress. - Hate the color white? Wear a soft grey or another soft color that’s light. - Dress like the boys in one of their many appearances in the color white. - Any musical act from the ‘90s – from BSB to ‘N Sync, Britney Spears, Garth Brooks, Reba McEntire, Whitney Houston, Mariah Carey, Hanson, Nirvana, Spice Girls, etc. - Think about your favorite 90s movies or television shows. If you love “Friends,” dress like Rachel or Phoebe. - Just be a 90s cliché. “If you literally have nothing to you want to wear jeans and a T-shirt, I suggested to a friend that your T-shirts could be graphic for high school and ‘90s night, (a) superhero shirt for Con night and (a) white (T-shirt) for the white party,” Nicole added. Just remember to have fun and be yourself in whatever you do.